Early demolition work for the Lynnwood Link Extension continues on Sound Transit owned residential properties in Shoreline. 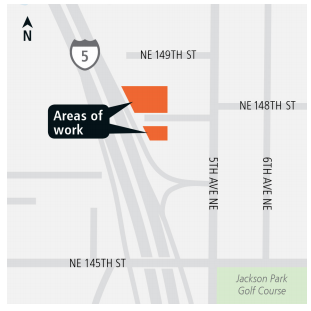 Four structures are in process of being removed on NE 148th St. The site is part of the NE 145th Shoreline South transit station. As part of Sound Transit’s commitment to sustainability, authorized salvage companies removed materials prior to demolition and the contractor will recycle clean wood, metal, concrete and other usable demolition debris. This early demolition work is an important step in the Lynnwood Link Extension. It will help clear the path for construction activities slated to begin in mid-2019 and minimize any potential unauthorized activity at these sites. Previously, 19 houses were removed on 7th and 8th NE, north of 185th, the site of the 185th transit station.